Help is on the way for the Anglophone reader in a global poetry world. 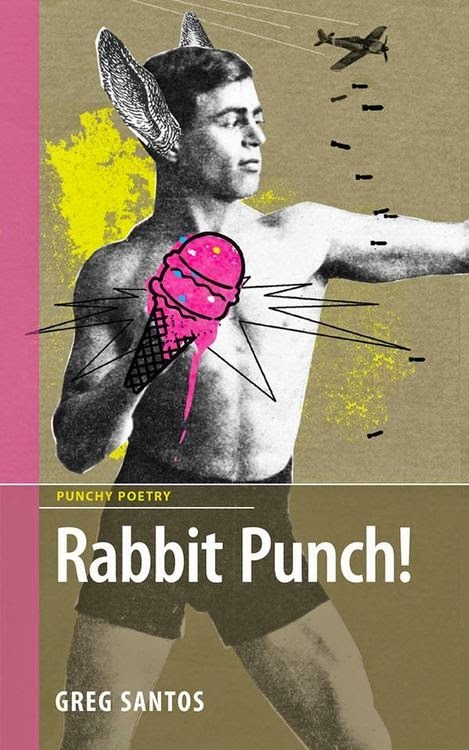 Rabbit Punch!, the second collection by Greg Santos, offers an admirable finesse to the reader who craves good verse. Rabbit Punch! is dedicated in memory to Paul Violi, whose humor and vibrant spirit helped make my time at Columbia and The New School a life-changing experience. Paul’s laughter and our conversations are sorely missed. New York is a little to the left of the centre of the universe. Everything is happening and I’m so there. Where? It isn’t important to know how but to just do things. They all make me want to write! Admittedly, I don’t like it when it’s just poetry thick. It needs to be varied. Suffering from the morning of the poem. He felt like God writing out the bible. He connected with their mind set. He really lived like a poet. He was pretty much a ghost. As readers, we appreciate such plainness (which is a complexity, as anyone knows who’s ever tried it), because it leaves no doubt as to the poet’s commitment: plainness trumps all merely erudite senses of the supposedly high-minded engagé author. And it’s impossible to miss the crucial difference between the student and teacher, signaled in this poem only by orthography, in the first line, where the Canadian spelling “centre” is used, in a poem dedicated to a man from Brooklyn. Zombies like the song because they can relate to it. They nod their heads, mouths agape. Zombies, however, do not like Rob Zombie. He is not an authentic zombie. He is a live human who has appropriated the zombie name. There is no greater zombie taboo. Look out, Rob Zombie! Behind you! and told us all to keep calm. I turned to my wife. No sitcom, no standup has the drop on this poetry. How often can you say that? “Mean Boys” was originally written as a response to the Virginia Tech Massacre. But then the shootings in Norway happened. And then the Boston Marathon bombing. Countless other atrocities are committed by lost young men every day. It was rewritten as a poem of defiance towards the “mean boys” of the world. The elm trees are making a break for it. The sun has nowhere to go but down. Children whisper to their water buffalo. Ripples on a dark lake are all that’s left of a struggle. The dog twitches and growls in its sleep. A spider senses a tug on its web. The boarded up corner store has a plank missing. She wonders briefly if she would still recognize him now. it ever being so cold? Here, syntax slows the spoken rhythm in the mind, with a craftsmanlike handling of enjambment (“Do you remember / it ever being so cold?”), and brings on a state in which the reader may once again savor poetry for the kinds of statement it alone can make. Reviewer bio: Erik Noonan is the author of the poetry collections Stances (Bird & Beckett, 2012) and Haiku d’Etat (Omerta, 2013). He lives in San Francisco with his wife Mireille.